To see the D-III Men’s Player of the Year Award, go here. Middlebury had the most efficient offense at D-III Nationals. On Saturday, the Pranksters’ O-line was broken just once, in the first half of their first game of the day. Sunday wasn’t much different, as Middlebury’s O-line was never broken in the quarterfinal against Mary Washington and played a perfect second half in their semifinal loss to Air Force. The driving force behind this efficient unit was Dylan Salzman. 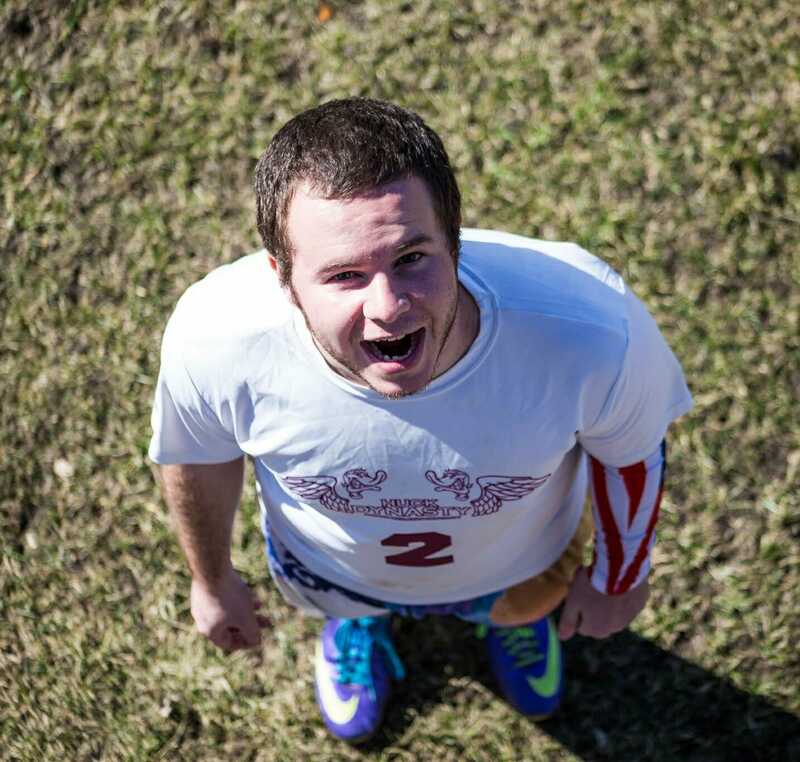 Salzman is your quintessential handler, capable of working the disc with both quick movement and big throws. Middlebury’s offense started most points with a pull play out of a side stack, and every play started with the disc being centered to Salzman. The Pranksters scored on multiple occasions with Salzman hitting a huck immediately out of this play. When the play was shut down, Salzman would calmly hit the reset and keep the offense flowing. 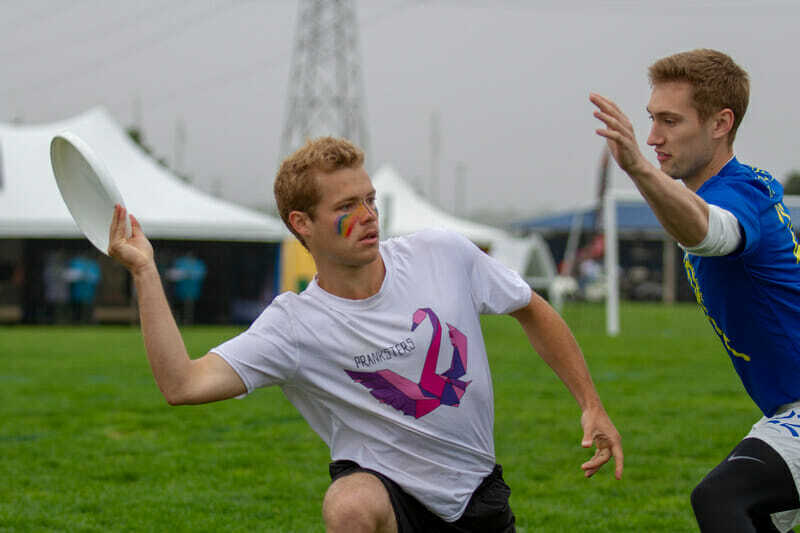 His composure with the disc trickled down to the rest of his line, and his leadership was evident in the playing styles of his teammates on offense. While Salzman’s statistical numbers are impressive, it’s the things he does that don’t show up in the box score that make him so valuable to the Pranksters’ offense. His cutting in the handler space is masterful, using a variety of cuts and hesitations to create openings for easy resets. Even when his teammates made these reset passes difficult, Salzman’s athleticism and quick reflexes saw him reel in some throws that would have eluded most other handlers in the division. Unfortunately for the rest of the division, Salzman was just a junior this season. The 2018 Offensive Player of the Year will return next season with an eye on taking Middlebury past the semifinals and to a National Championship. The center handler for GoP’s vaunted offense, Eichner fit the “quarterback” analogy so often thrown around for handlers to a T. Directing traffic and controlling the flow of the entire offensive unit, Eichner’s leadership combined with his exceptional throwing ability were among the keys to GoP’s run to the semifinals at Nationals. Farwell was a joy to watch this season. The lefty handler made the game look easy, getting the disc at will and stepping up to make the big throws when his team needed them most. The front-runner for this award coming into Nationals, Farwell will return for his senior season looking to lead Whitman to a stronger performance at Nationals in 2019 and make a push to usurp Salzman for this award. Air Force Afterburn was dominant throughout the 2018 season. Defensively, their speed and athleticism wore teams down, and stifled offenses. On a team with many great defenders, Noa Chun-Moy stood out above the rest. As 2017’s Breakout Player of the Year, Chun-Moy entered the season with higher expectations, but he was able to meet and even exceed those. Throughout D-III Nationals, he took on the marquee matchup on just about every team Air Force came up against. Extremely quick and agile, Chun-Moy was a tough defender for anyone to shed during the season. He used his speed to get chase-down D’s, and showed grit and toughness laying out for any disc in his vicinity. The big-play ability of Noa’s defense not only shut down the best player of many opposing teams, but also fueled the Air Force team energy. Time and time again, Noa would make a big play that ignited an Air Force run. 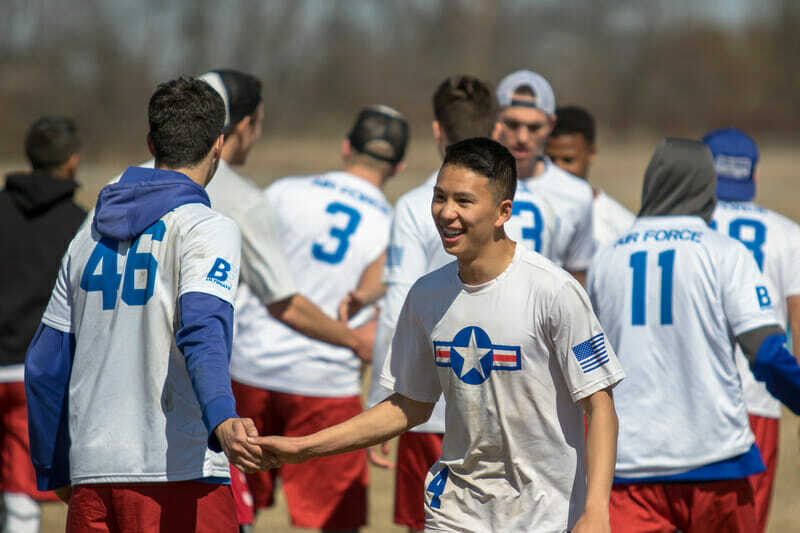 Against Bowdoin, in the first game of D-III Nationals, trailing 11-9, Chun-Moy made a handful of huge plays that brought Air Force back, and Afterburn won them the game 12-11. Big plays leading to big runs was a common occurrence for Noa Chun-Moy all spring. Taking on the toughest matchup in every game is extremely draining, but Noa Chun-Moy never looked tired, and excelled throughout the season. Entering his senior season, Chun Moy’s expectations will be higher than ever; we’ll see if he can exceed them once again. While it can be difficult to stand out in a zone defense, Kelson played the deep role in Bryant’s unbeatable 4-2-1 zone to perfection. While impressive in this position all season, Kelson particularly shone in the final of Nationals, making multiple big time blocks on deep, over-the-top looks from Air Force to help secure Craze’s first national title. Anybody who played against Swanson this season will testify to just how athletic he is, and he used his athleticism to tremendous effect on the defensive side of the disc this season. Whether it was going up over his matchup or making a layout block he had no business reaching, Swanson made more incredible blocks this season than most players will earn in their entire career. A member of the 2016 WJUC team, Kai DeLorenzo came into college ultimate with a bit of a reputation already. While a solid player in the division as a freshman in 2017, DeLorenzo wasn’t dominant last year. The praise you heard for his game always came with the “…for a freshman” qualifier. Not anymore. DeLorenzo asserted himself with a monster season in 2018 and is the winner of this year’s Breakout Player of the Year Award. While Salzman controlled the handler space for Middlebury, it was DeLorenzo making all of the big plays downfield. 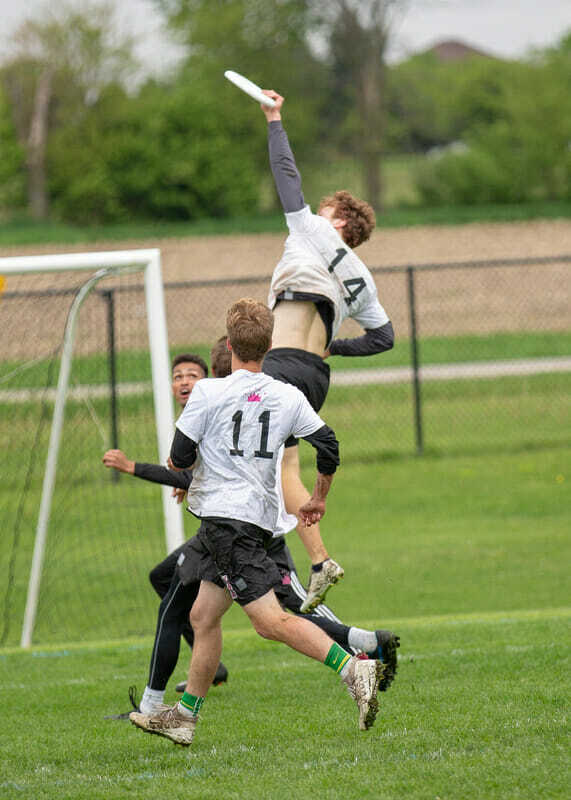 The 6’2 sophomore was one of the best cutters in the division this season, chewing up major yards on unders on Middlebury’s pull plays, and he was dominant in the air coming down with hucks. 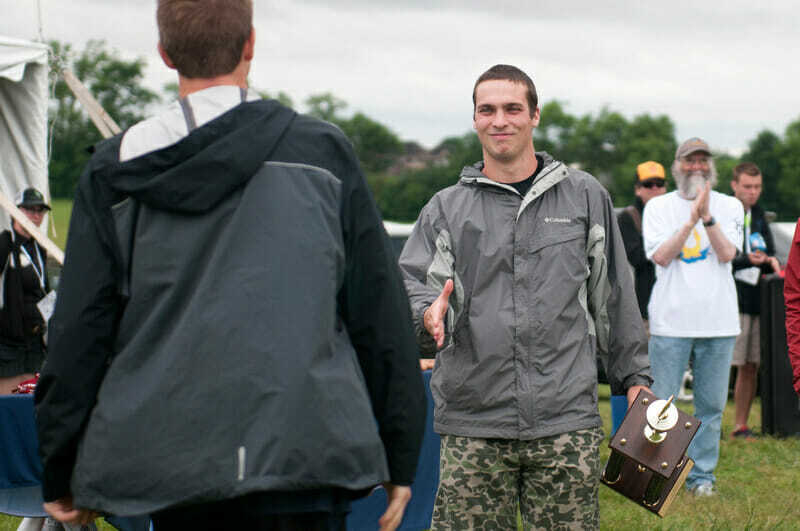 DeLorenzo played the highest number of points for Middlebury at Nationals, and he had the stamina to take a heavy load on both sides of the disc. He was a force of nature in the first half against Mary Washington in the quarterfinals, tallying five assists and a goal while playing all but a few points. 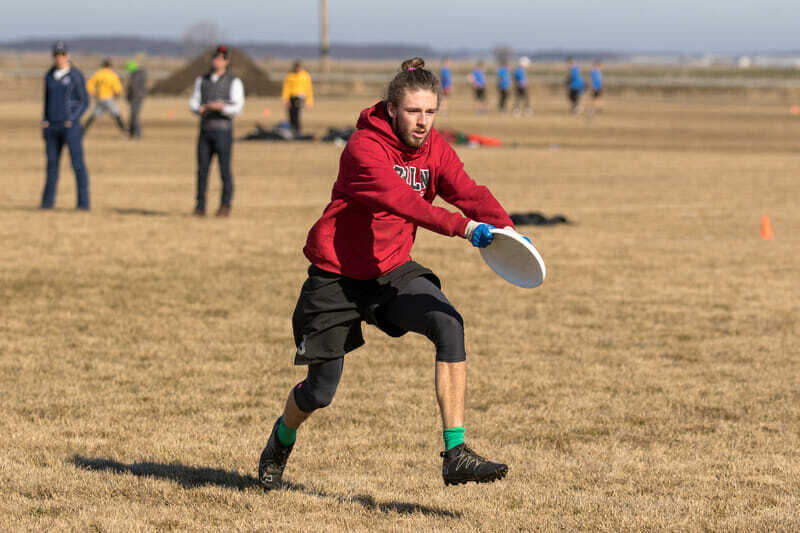 His athleticism translated seamlessly to the defensive side of the disc, and he nullified the top deep threat of multiple opponents over the course of the weekend. As dominant as DeLorenzo was this season, the rising junior still has plenty of room for growth. His throwing ability is above average, but his decision-making often left plenty to be desired. However, should the young Middlebury star continue on this trajectory, we could be seeing DeLorenzo take the leap from BPOTY in 2018 to the POTY conversation in 2019. While most of the spotlight was deservedly on Bryant’s stars Alex Kenworthy and Cameron Jack, it was often Kunkel who was making the big plays for Craze’s offense. Kunkel is incredibly fast, and the rising senior was the perfect compliment to Kenworthy downfield. It’ll be interesting to watch how Kunkel steps into Kenworthy’s role as the primary cutter next season. It’s hard not to stand out when your team is playing with only nine players, but Headley was a revelation for Ironfist this season. The rising junior stepped up and made play after play on both sides of the disc, participating in an incredible number of points while always running with the energy of someone stepping on to the field for the first time. His playmaking ability will be much needed next season, as Headley will be asked to replace a large chunk of the production being lost by the graduation of Grant Bruner and Ethan Bolthouse. Entering the season, the Ohio Valley Region was a bit of an unknown. With the graduation of Dom Schuster and the other stars from Franciscan, the region was left wide open. Oberlin came out of nowhere, with a strong showing at D-III Midwestern Invite, before taking the regional championship and claiming a spot at Nationals this year. A large part of their success was on the back of freshman Noah Zobel. In D-III, freshmen have an unique opportunity to shine, no matter who they are. A superb athlete at 6’3”, Zobel is a big standout player, who would have been capable of making an impact on any D-III roster. Add in high school playing experience with Amherst High School and Youth Club Championships experience with Boston BUDA–two of the most prestigious youth programs in the country–and the impact of Zobel was unparalleled. Defensively, Zobel was able to shut down the deep space consistently as a part of the Oberlin zone. A combination of size and athleticism, he was tough for any team to navigate past throughout the year. Offensively, Zobel lead the team in goals at D-III Nationals by a large margin; the rookie finished the tournament with 16 goals and six assists. When teams started to play behind Zobel, taking away his deep game, he was able to counter, with tremendous disc skills, taking in-cuts, and moving the disc downfield further with his throwing. Zobel played a huge part of the success for Oberlin in 2018, and should continue to do so for a team on the rise in the coming years. One of the best handler defenders in Rockford, Hanson’s defense and composure after a turn made it hard to believe that he was only a freshman. All season long, Hanson would make opposing handlers struggle to get open for resets, then turn around and run them into the ground after the turn. Most freshmen in college ultimate are stuck on the D-line, where their inexperience is less costly than on offense. Choezin isn’t like most freshman. Playing O-line almost from day one, Choezin displayed a maturity beyond his years this season, exhibiting throws and decision-making uncommon from rookies in this division. In 2017, Carleton GoP failed to qualify for D-III Nationals for the first time since the division became an official part of USA Ultimate. In 2018, GoP qualified for Nationals and made it all the way to the semifinals. Two of the biggest contributors to this turnaround were the 2018 Co-Coaches of the Year, Michael Massad and Anders Berglund. A team that has traditionally not had a coach, Massad and Berglund proved to be the perfect duo to break the seal for GoP. Massad was the calm leader, calling lines and overseeing the team from a big picture perspective. Berglund was the fiery tactician, bringing a new style of offense and vocal passion to the GoP sideline. Most importantly, Massad and Berglund are both alumni of the program, giving them a unique understanding of the balance between fun and competition on GoP. Berglund created a system with GoP this season that became one of the strongest offensive units in the country, and Massad developed a team from the bottom up that could compete whenever their number was called upon. While GoP lacked the starpower of many teams at Nationals, the depth built by Massad over the course of the season paid dividends, as GoP was able to utilize almost the entire roster to wear opposing offenses down, finishing first in Pool D and making it to the semifinals. Massad and Berglund demonstrated this season just how much of an impact good coaching can make, even on the most established of programs. Detox came into Nationals with low expectations as the bottom overall seed in the tournament. Not only did they qualify for the bracket from what most perceived as the “pool of death”, but they also came within two points of qualifying for the quarterfinals. Warden had clearly done his homework before Nationals, preparing his team with unique game plans for each opponent, and should be given a large portion of the credit for Occidental’s stellar showing in Rockford. It’s not often that you come across an unbeatable strategy in ultimate, but the zone defense run by Bryant this season was exactly that. Bishop and his coaching staff created a defense that frustrated opponents to no end, utilizing the athleticism on Bryant’s roster to its full potential. Rather than switching to person defense when opponents began to figure out the zone, Bishop would make small tweaks and adjustments to Craze’s base defense. This was never more evident than in the final of Nationals, when adjustments made by Bishop sparked a 6-0 run that led Bryant to the title. 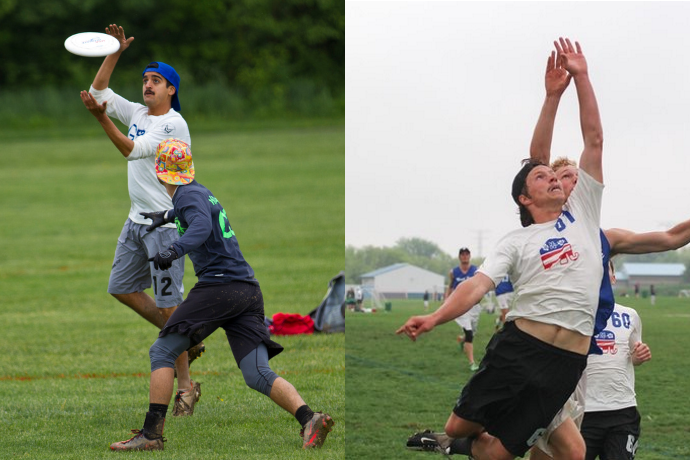 Comments on "D-III Men’s 2018 College Awards, Presented By Spin Ultimate & NUTC"